Interactive server which lets you view the Earth and Moon, as illuminated by the Sun at the time of your request, from a variety of viewpoints. An interactive animation illustrates how orbits around compact objects such as neutron stars and black holes depart drastically from Kepler's laws, and explains why. Solar System Live , an interactive orrery for the Web, lets you view the solar system in a variety of ways for any date between 4713 B.C. and A.D. 8000. An ephemeris can be displayed for any location on Earth and, given orbital elements in the form published in the IAU Circulars, the orbit and position of asteroids and comets can be plotted. Space Shuttle imagery and interactive Web navigation combine to allow you to explore Switzerland, home of www.fourmilab.ch, from orbit. Your Sky makes custom maps of the sky for any location on Earth and any date from 4713 B.C. into the distant future. Maps can include stars as faint as magnitude 6.5, constellation names, outlines, and boundaries, the Moon and planets, deep sky objects from a database of more than 500, and a comet or asteroid whose position is calculated from its orbital elements. A variety of display options allow customising the map for its intended use. The total solar eclipse of July 11th, 2010 made a landfall in Easter Island, one of the most remote inhabited places on the Earth, and Fourmilab was there to observe and photograph the eclipse and explore the enigmatic artefacts of the island. This photo gallery chronicles the expedition and includes telephoto imagery of the eclipsed Sun. Between July 19th and August 6th, 2008 I was off to the North Pole—no, really—and thereafter to observe the total eclipse of the Sun on August 1st. So how do you get to the North Pole? Well, there's always the tedious dogsled method, but if you're in a hurry, nothing beats a Russian nuclear powered icebreaker. Here is a collection of images from the expedition, including the ship, landscapes, wildlife, and the eclipse. Due to the finite speed of light, observers in different locations or moving with respect to one another may see events as occurring in different orders—simultaneity depends upon your viewpoint. You've heard the mission control recording of Apollo 11 landing on the Moon, but what did it sound like on board the lunar module? This document demonstrates the relativity of simultaneity and lets you experience the Eagle 's touchdown from a lunar perspective, providing an insight about Neil Armstrong's first radio transmission after the landing. More than two months of computer time, nine billion numerical integration steps, trillions of floating point operations, five terabytes of intermediate results, and 3.6 gigabytes of output went into the preparation of this catalogue of every transit of a planet in front of the Sun as viewed from any other planet in the Solar System for the years ±125,000. If you missed the recent transits of Mercury and Venus, here's your guide to coming attractions (as well as what you've missed), including the simultaneous transit of Mercury and Venus visible from Earth in July 69163, the triple transit of Venus, Earth, and the Moon from Saturn in December 23364, and much more—a total of 1,011,793 transits in all. Animations and images illustrate rare events, and all data and the programs used to produce them may be downloaded for your own investigations. In the first few days of July 2004, three unrelated celestial phenomena happened to coincide: full Moon, lunar perigee, and Earth's passage through aphelion. This permitted photographing the full Moon and Sun within one day, showing the difference in their apparent size. The effect of the Sun and Moon's orbits on the appearance and duration of solar eclipses is discussed, and an estimate is made of when the last-ever total solar eclipse will be visible from Earth. New: January 26th, 2005 update adds photos of the apogean full Moon of January 2005 compared to the Sun with the Earth near perihelion. On June 8th, 2004, for the first time since 1882, the planet Venus passed in front of the Sun as seen from Earth. This spectacle is not only rare, it's about the only opportunity one ever gets to see another planet with the unaided eye as a spot, not a dot. Fourmilab was blessed with almost equally rare cloudless skies for this event, which permitted capturing the images presented on this page. In November 2003 an unusually bright total lunar eclipse was visible from all continents except Australia. At my observing site in western Switzerland, the Moon was high in the sky throughout the eclipse and, astonishingly for November, the sky was clear for the entire immersion phase and almost all of totality. This page describes the eclipse and presents images captured with a telescope and digital camera, including an animation which shows the Moon's encounter with the Earth's shadow. Only fourteen times in the twenty-first century will astronomers be treated to the spectacle of Mercury's silhouette majestically traversing the Sun. This century's first transit of Mercury occurred on May 7th, 2003, and was the first I ever managed to observe and photograph. Information and images of 2003's transit are presented, along with previews of coming attractions including the spectacular and extraordinarily rare transits of Venus in 2004 and 2012. Images of the total solar eclipse of June 21st, 2001, observed near Lusaka, Zambia, plus wildlife and scenery from Zambia, Zimbabwe, Botswana, and South Africa. A Rocket A Day Keeps the High Costs Away asks why it is, considering that the V2 cost about US$13,000 each (1945 dollars) and could be launched at rates approaching 100 a week, that today's launchers cost 1000 times as much. A market-oriented approach to overcome the current cost barrier to space development is suggested. Rocket engineering is complicated and demanding, but rocket science is pretty straightforward. Explore the rocket equation, which governs the operation of all rockets, and understand why it's so difficult to get to orbit from the surface of the Earth and why multistage rockets make sense. Manned orbiting battle stations, armed with rapid-fire machine guns! Bad science fiction? Well, actually, space age history, just recently revealed. Read all about it, and explore guns in space: yesterday, today, and tomorrow. On October 15th, 1991 a proton with an energy of 3×1020 electron volts slammed into in the Earth's atmosphere. Let's crunch some numbers…. A performance comparison with 24th century Galaxy Class starship technology is presented. On rare occasions around peaks in the 11 year solar activity cycle, a sunspot group may appear which is sufficiently large to be observed without any optical aid other than a filter for safely viewing the Sun. If observing this phenomenon interests you, don't count on quick success; it took me thirty-five years from the time I started looking until I observed my first naked-eye sunspot on September 23rd, 2000. This document contains photos of that enormous sunspot, both my own and high resolution images from spacecraft and a solar observatory, and provides tips and resources to assist in your own quest to view the next “big one”. Images and movies of the total solar eclipse of August 11th, 1999, which I observed from Esfahan, in central Iran. Images of Comet C/1995 O1 (Hale-Bopp), the Great Comet of 1997. Images of Comet C/1996 B2 (Hyakutake) from its 1996 close encounter with Earth. Inconstant Moon explores a universally seen but seldom observed phenomenon: the different appearance of the Moon at perigee and apogee. The only reason Einstein's special theory of relativity seems weird to those learning it is that the velocities we're familiar with are such a tiny fraction of the speed of light we've never had a chance to gain an intuitive sense of relativistic effects. If the speed of light were 100 kilometres per hour, footballers would have no trouble dealing with relativistic goal shots. C-ship uses computer image synthesis to put you aboard a starship entirely consistent with the laws of physics and lets you look out the window to experience special relativity with your own eyes. This “basement science” experiment demonstrates the universality of gravitation, showing the gravitational attraction between masses of less than a kilogram. Could Archimedes have discovered universal gravitation nineteen centuries before Newton? Well, let's see…. Did you know that when the planet Venus is bright and far from the Sun it can be glimpsed with the unaided eye in broad daylight? This page provides tips for viewing Venus in the daytime, plus a calculator which shows the best opportunities for any year and produces finder charts for your observing site. Here's an opportunity to see something that's up in the sky for anybody to spot but which few ever do: a planet shining in the blue sky at midday. Fast interstellar travel will never be possible with any kind of rocket, regardless of the energy source (be it chemical, nuclear, or antimatter), due to the need to carry the rocket's reaction mass on board. How can a person who coined the maxim “Never invest in something that violates a conservation law” seriously entertain the possibility of “propellantless propulsion”? This brief document speculates on how a “Vacuum Propeller” might be built which violates no law of physics. This directory contains the file poss.zip, a Zipped archive which extracts into the file poss.xls. This is a Microsoft Excel 5.0 (or above) workbook which contains a catalogue of the Palomar Observatory Sky Survey plates, including the mapping between the original plates and the MicroSky microfiche edition published by Deen Publications, Inc.
Home Planet is a Microsoft Windows 3.1, 95/98/Me, and NT/2000/XP application which puts a somewhat different spin on the usual astronomical or planetarium program. Home Planet places the Earth in its place in the universe, allowing one to look up toward the stars or down upon the Earth from a variety of perspectives. Comprehensive documentation is included in a hypertext help file. For additional information and instructions on how to download and install the software, please see the online documentation. New: screen saver updated for Windows XP dual screen and registry-based individual settings, and to use the cloudless Earth image. What better way to protect your monitor's phosphor than by smashing rocks into it at dozens of kilometres per second? The Craters Screen Saver simulates cratering of initially flat terrain, obeying the same power-law relating crater size to number observed on airless solar system bodies. New version 3.0 is compatible with dual screen configurations on Windows XP and saves preferences in the registry individually for each user. 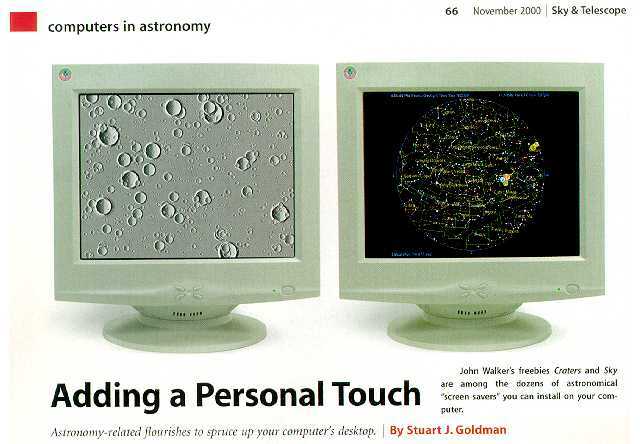 This is a minimalist screen saver originally released in 1994 which appeared in the November 2000 issue of Sky & Telescope magazine. Retro-computing enthusiasts may download the original version for Windows 3.1 which runs fine on a 20 Mhz 80386 and will probably work on a PC/AT with an EGA. Microsoft Windows tool which displays the current phase of the Moon in an icon and other information when opened. The program is in the public domain and complete source code is available. New 1999 release includes a 32-bit version which supports the Windows 95/98/NT time zone setting, works for all non-negative Julian day numbers, minimises to the system tray, and includes a Help file. For old time's sake, an updated 16-bit version compatible with Windows 3.0 and above is also available. The Earth Screen Saver (for 32-bit systems such as Windows 95/98/Me and NT/2000/XP only) shows the Earth with the correct illumination based on the date and time. You can view the Earth from the Sun (day side), Moon, night side, or at a given altitude above any location specified by latitude and longitude. New version 3.1 is compatible with dual screen configurations on Windows XP and saves preferences in the registry individually for each user. Now you never need to go outside again! Sky Screen Saver shows the sky as it presently appears including stars from the more than 9000 star Yale Bright Star Catalogue, the Sun, Moon (with the correct phase), and planets, deep sky objects drawn from a database of more than 500 prominent objects including all Messier objects, constellation names, boundaries, and outlines, and ecliptic and equatorial co-ordinates. All of these items can be individually selected to customise the display. The screen saver can be configured for any time zone and any location on Earth. This program is based on the more comprehensive star map window of Home Planet , adapted to be a self-contained and well-behaved screen saver. Like Home Planet, this program is in the public domain. New version 3.1 (July 2006) saves preferences in the registry individually for each user. Displays an icon with the current phase of the Moon on an OpenLook or SunView screen. When opened, up-to-date information is displayed about the Sun and Moon. OpenWindows utility which shows you, as an icon or resizeable window, the portion of the Earth currently day and night. In conjunction with the “Two Line Elements” posted to the space newsgroups periodically or obtained by FTP, lets you track Earth satellites, with the current satellite position shown on the map.